Although the main rivers of the plains originate in the Himalayas, they form the most important physiographic features of the Indo-Gangetic Plains. In fact, it is these river systems that have made the plains what they are: highly fertile lands supporting extensive agriculture, which have cradled some of the greatest civilizations in history. It is remarkable that the great rivers of the northern part of the Indian subcontinent spring from almost the same territory, in fact, from within a few tens of kilometres of each other, separated by water divides. The glaciers of the Kailas Range east of the holy lake of Manasarowar in Tibet are the source of the east-flowing Brahmaputra. The Indus also rises from the same range, northwest of Manasarowar (Tso Mapham or Tso Mavang in Tibetan and Mapam Yumco in Chinese), but takes a north-westerly course from there, almost the opposite of the Tsangpo, as the Brahmaputra is called in Tibet (and which has now been renamed Yarlung Zangbo Jiang by the Chinese). The Satluj, born from the Rakas Lake (Lengak Tso in Tibetan and La’nga Co in Chinese) west of Manasarowar, also follows a westerly route. The Bhagirathi and the Alaknanda together with their tributaries, which further down grow into the Ganga, have their genesis in the snow-clad peaks of the Great Himalayan ranges, across from Manasarowar, only 100 km away. Some Himalayan streams are the most remarkable examples of antecedent rivers, that is, streams that have maintained their original course or direction by deepening their valleys simultaneously while the uplift of the mountains was in progress, thus becoming permanently entrenched in the rising topography. 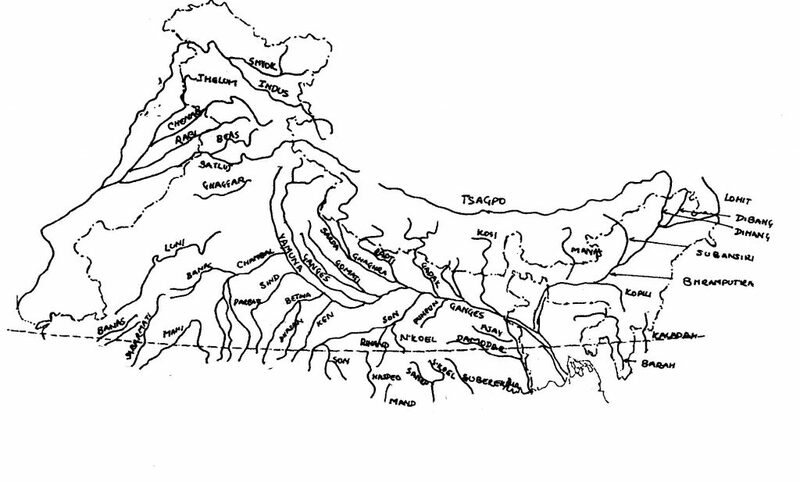 These rivers have been in existence before the tectonic processes raised the Himalayas and are truly ancient. They have carved their channels through mountains with peaks that now rise high above the level of their source. The deep valleys or gorges that have been cut through the ranges have not resulted from headward erosion as in the case of the peninsular rivers. These antecedent gorges of the Himalayan Rivers, both great and small, are among the deepest cuttings in the world. In comparison, the gorges of the Swiss Alps pale into insignificance. The Indus, Satluj and the Brahmaputra flow for long distances, the first two westward and the third eastwards, before they make sharp changes in their direction to descend to the plains after cutting step defiles right across high mountains. Some of these gorges are deep slit-like gashes cut in the bottom of V-shaped valleys, which go to show that there was an increased rate of their rejuvenation during the Pleistocene and Holocene times. For example, the Indus has cut through over 5,000 m of rock – first vertical walled gorges and then by a series of steps before it enters the plains. The Indus flows at an average level of 1,300 m above the sea north of the Nanga Parbat which rises steeply to 8,125 m within a few kilometres of the channel. The immense difference in the height of the two is due to the antecedent character of the river supplemented by uplift in very recent times. The Hunza River, a tributary of the Indus, flows at a level of about 1,800 m, while the Mount Rakaposhi rises to 7,788 m only some four kilometres away. The Satluj River gashes through the high Zaskar Range by a similar transverse gorge carving out a perpendicular defile of 1,800-2,000 m depth at Shipki. The Kali River on the Kumaon-Nepal border pierces through the mountains at a level of only 1,500 m between the Nanda Devi (7,817 m) and Api (7,132 m) peaks. Several rivers of Nepal have also made similar incisions across the strike of the mountains. The Kali Gandak River flows only at an elevation of 1,200 m at Dana between the summits of Dhaulagiri (8,172 m) and Annapurna (8,078 m) only 55 km apart. The bed level of the Arun, in eastern Nepal, is only at 1,800 m altitude between the ranges ion which the towering peaks of Mount Everest-Makalu (8,848 – 8,481 m) and the Kanchenjunga (8,598 m) preside. The courses of most the Himalayan rivers are controlled by the strike and the structure of the mountains, except where streams cut across the grain of the mountains in their antecedent phase. The Indus, for example, flows in a northwest direction through a strike valley between the Higher Himalaya and turns southwards near Gilgit between two ranges which formed a natural defile before their uplift. Tsangpo, rising in the same area, on the other hand, takes an easterly course through a much less rugged region and follows the depression of the suture zone. The sudden change in its direction to the south around the Namche Barwa peak is controlled by the eastern syntaxis just as that of the Indus is influenced by the western syntaxis. The rivers of the Garhwal to Arunachal Himalayas flow south down the slopes of the glacier-clad ranges but receive tributaries which follow the east-west general strike of the hills. In both cases, the directions are controlled by a combination of slope and the main structures, aided sometimes by faults. Once they come down from the hills they are controlled by the morphology of the plains. The Alaknanda and Bhagirathi Rivers join together at Devaprayag in the Uttarakhand Division of Uttar Pradesh to form the Ganga. The Pindar, Mandakini, Dhauliganga and the Bishenganga Rivers that pour into the Alaknanda and the Bheling that flows into the Bhagirathi originate from the high glaciers and snow-capped peaks of the Tehri-Garhwal ranges. They all have cut stupendously deep gorges and incised meanders during their passage through the mountains. The very steep-sided, often vertical, Bhagirathi gorge between Srikanta and Bandarpunch peaks – six km west of the former and 13 km east of the latter – lies 4,000 m below them. The Ganga descends into the plains at Hardwar. Along with its main tributary, the Yamuna, it forms a great alluvial tract, called the doab, meaning a tract of country between two rivers. The Yamuna also has its source in the Himalaya: the Yamunotri Glacier on the Bandarpunch Peak in Garhwal, not far from the birthplace of the Bhagirathi. After cutting across the Nag Tibba, Mussoorie and Siwalik Ranges, it emerges on the plains above Paonta in Himachal Pradesh. Its main effluent in the upper reaches is the Tons, which also rises from the Bandarpunch glaciers and meets the Yamuna right below Kalsi before the latter leaves the hills. Both form steep gradients in their Himalayan journey. The Yamuna takes a southerly course in the plains upto Mathura, from where it turns south-easterly until it unites with the Ganga at the holy Prayag (Allahabad). It traverses a total of almost 1,400 km from its source to its confluence. In the plains, the Yamuna becomes a gentle-flowing stream. The Yamuna originally formed a part of the Indus system. During the late Pleistocene and early Holocene, it joined with the Saraswati somewhere near Suratgarh, north of Bikaner, and continued to flow as Ghaggar (Hakra in Pakistan) finally pouring into the Indus, or according to another view directly into the Rann of Kutch. The ancient Yamuna was captured by a tectonic disturbance along the Aravalli axis to become finally a tributary of the Ganga. Among the many other tributaries of the Ganga rising from the Himalayas are the Ghaghara, Gandak and the Kosi, along with several minor ones; those which flow down from the peninsular highlands include the Chambal, Betwa and the Ken into the Yamuna, and the Son directly into the Ganga, but the passage of these rivers through the plains is very short. The rivers in the plains flow through an extremely flat surface, which accounts for the absence of a dendritic drainage pattern along them. The Ghaghara River is so identified during its traverse through the Gangetic Plains, but is known as the Karnaili in western Nepal. It originates near the Gurla Mandhata peak, south of Manasarowar, in Tibet. It first flows southeast and then south-southwest cutting across the Higher Himalaya through a succession of steep defiles. In its south-easterly course it passes through a remarkable trough with Gulra Mandhata (7,728 m) on one side and Api (7,132 m) on the other. The Ghaghara joins the Ganga near Chapra in Bihar. The Kali River also rises behind the Great Himalayas from the snows of the high glaciers. It forms the boundary between Nepal and Kumaon for most of its transit across the mountains, also carving out colossal ravines through them. While the height of its bed in the northern segment is about 3,000 m, the Api peak rises immediately to its east. The Kali has several feeders in the high ranges. After it reaches the plains near Tanakpur, it is known as the Sharda (or Chauka). At the tri-junction of Sitapur-Barabanki-Bahraich districts of Uttar Pradesh, it terminates into the Ghaghara. The Gandak River, which pours into the Ganga at Hajipur in Vaishali district of Bihar, a few kilometres below the mouth of the Ghaghara, also has most of its distributaries in the Nepal Himalayas. They are the Kali Gandak, Burhi Gandak and Trishuli. Near the axis of the ranges the heights of their beds is only 1,500-2,000 m, while the surrounding peaks reach elevations up to 8,000 m. For example, the elevation of the floor of the Kali Gandak is 1,500 m but the Dhaulagiri massif only 6.5 km away reaches the stupendous elevation of 8,172 m.
The Arun River is one of the most important of the Himalayan streams to join the Ganga after being named the Kosi in the plains. In the high mountains, the Arun has several branches which are fed by the glaciers of the Gauri Shankar-Everest-Makalu-Kanchenjunga group of peaks. In the upper reaches, they all strike transverse to the trend of the Himalayan and form immense gorges while forcing their passage through the mighty ranges. The farthest part of the stream that could be considered as its source lies on the Shisha Pangma peak (8,013 m) in Tibet. From the north of this summit, the Arun flows easterly and then from northeast of the Everest-Makalu massif it swings southwards carving out a remarkable defile only 25 km to their east and not far from Kanchenjunga (8,096 m) – its bed in this section is only 1,800 m high. The Chambal River springs up in the highlands west of Mhow in Madhya Pradesh and pursues a north-westerly course to debouch ultimately into the Yamuna in Etawah district of Uttar Pradesh. It has been impounded north of Mandsaur to create the Gandhi Sagar reservoir. Several effluents have been captured by it, all passing through the East Rajasthan Uplands and Madhya Bharat Pathar. The Betwa River unites with the Yamuna at Hamirpur in Uttar Pradesh, after it takes its birth in the southern Bhopal Plateau. The Ken River is formed by the union of several tributaries that arise from the Bhanrer Range. The Ken joins the Yamuna some 60 km downstream from the mouth of the Betwa. Both these rivers pass mainly through the Vindhyan sedimentary and Bundelkhand granite terrains. The Son River springs up from the Pendra Plateau, not far from the birthplace of the Narmada. After flowing in a north-westerly direction, it takes a right angle swing to a north-easterly direction at Sarsi where converge the borders of Jabalpur, Shahdol and Satna districts of Madhya Pradesh. It finally joins the Ganga at Dehri in Bihar. Along most of its journey, it moves over the Vindhya Plateau. The Ganga is a braided river with numerous channels and sand bars, unlike the Yamuna. On the other hand, the Yamuna flows between steep banks, which are subject to intensive gully erosion; along with the Chambal, the Yamuna has given rise to the notorious ravines which form extensive badlands. The Ghaghara (Sarju) is also an aggrading river and has been fluctuating in its course continually within a wide belt. The Kosi has been shifting its course during recent years at an alarming rate. 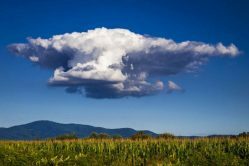 In the early part of this century, it started moving swiftly towards the west after entering the plains, capturing the channels of several smaller streams and causing catastrophic damage to the land in its path. The Ganga becomes Padma with a host of small streams shooting out of it to form a maze in lower Bengal. The criss-crossing channels have created numerous islands in the delta. These support the densely-forested swamps of the Sunderbans which provide ideal conditions for the formation of peat. Coal seams of the Gondwana age originated under similar conditions. Drilling in the Ganga delta has revealed several buried peat beds with intervening deposits of sand and clay. This sequence indicates repeated alternations of sedimentation and plant growth with the actual surface never far from the sea level. The delta has multiple origins. The Ganga waters have shifted eastward; their original course was through the Bhagirathi-Hooghly channels, but now the main outlet is through the Meghna-Padma streams. From its hallowed birthplace at Gomukh in the snowfed ranges of the Himalayas to Ganga Sagar, where the Ganga traditionally embraces the Bay of Bengal, it has journeyed for almost 2,500 km. The delta front of the Ganga is a highly indented arc of about 400 km length, extending from the mouth of the Meghna River in Bangladesh to the mouth of the Hooghly. It projects 40-50 km outward into the Bay of Bengal as a result of deposition of enormous amounts of sediments brought by the mighty Ganga-Brahmaputra system. The amount of sediments is estimated at almost 40,000 billion cubic metres annually, enough to cover the entire Bay to a depth of 2 mm every year. The delta is made of a web of distributaries and islands, and covers an area of about 75,000 sq km. Most of it is occupied by a dense forest, the well-known Sunderbans, habitat of the famous Royal Bengal tiger. Most of the land of the delta is a low-lying swamp, which is flooded by marine water during high tide. The river is called the Tsangpo in Tibet; Chinese maps show it as Yarlung Zangbo Jiang. It originates in the glaciers of the Kailas Range, about 150 km distant from the source of the west-flowing Indus and 35 km from the birth place of the Satluj on the other side of the water divide. The river journeys for 1,100 km eastwards within the depression formed by the Indus-Tsangpo Suture Zone, bounded on the south by the ranges of the Great Himalayas and on the north by the Kailas Range and its eastward extension, the Nyainqentanglha Range. In spite of the immense elevation, the Tsangpo flows through Tibet as a sluggish and navigable river through a wide valley. Its bed is 3,525 m high at Tradom (Teladuomu), 3,300 m at Shigatse and 2,450 m north of Namche Barwa from where it loops southward; but when it emerges at the head of the Assam Valley, the altitude rapidly falls to only 135 m at Sadiya. The Tsangpo receives several tributaries through this stretch, mainly from the north. The most well-known is the stream that runs past Lhasa, the Gya Chhu, and joins the Tsangpo on its left at Chushul (Quxu). Among the other north-originating effluents are the Raga Zangbo, which issues from the snows of western Nyainqengtang and progresses eastwards parallel to the Tsangpo, but north of the water divide, discharging at Pindzoling (Puncogling); and the Gyamada Chhu that meets the Tsangpo at Tselha Dzong where it is over three kilometres wide. The only stream of any consequence that drains from the Himalayas on the south into the Tsangpo is the Nyang at Shigatse (Xigaze); the trading post of Gyantse (Gyangze) is situated on it. Towards the end of its journey through Tibet, the Brahmaputra makes a loop around the Namche Barwa peak to surge south-westward and then southward in a succession of rapids and cuts across the eastern Himalaya through the Dihang or Siang Gorge, when it emerges from the mountains near Sadiya in the Dibrugarh plains of the Upper Assam Valley. The Dihang Gorge is merely 90 m wide at places but is 5,485 m below Namche Barwa (7,757 m). From Sadiya its course takes a westerly trend through the narrow Assam Valley, and veers south after it enters Bangladesh. Several smaller streams pay tribute to the mighty Brahmaputra during its long passage through the plains. The Lohit and the Dibang (or Sikang) and several smaller streams drain into it from the high mountainous Eastern Himalaya at Sadiya in forming what looks like a ‘delta in reverse’ on the map. A large number of streams descend to the Brahmaputra from the Himalayan ranges to the north, among them the Subansiri, Kameng, Manas-Mora Manas, Gangadhar, Raidah, Dharla and the Tista. The Manas-Mora Manas make an intricate system of drainage, forming a marshy ground in their lower reaches. Numerous streams also debouch into the Brahmaputra from the south in the Assam Valley, among them the Burhi Dihing, Dhansiri and the Kalang. The Brahmaputra has a braided channel for most of its passage in Assam, and there is constant shifting of these channels and sandy shoals. With its tributaries discharging enormous quantities of water and silt, the river causes disastrous floods every monsoon. The havoc the floods produce and the misery they bring in their wake make the Brahmaputra truly a ‘River of Sorrow’. The Brahmaputra bends southward around the Garo Hills to enter Bangladesh near Dhubri, and ends its 2,900 km long journey when it joins the Ganga at Goalundo, in Bangladesh, from where the combined Ganga and Brahmaputra are called the Padma. About 100 km further downstream the Padma is joined by the Meghna, rising from the mountainous regions of Assam, which pours into the Bay of Bengal. During its passage through the Bengal plains, the Brahmaputra is an aggrading steam and has an interlacing drainage pattern. It continually shifts its channels, and in spite of its low gradient in Assam its erosive power is enormous. Its shift in recent years to the south has been quite marked in the Assam plains. In this process, it has completely swallowed the town of Palasbari in Kamrup district, and is now in the process of nibbling away Dibrugarh and Goalpara towns. The most significant change in its course has been in Bangladesh. As shown in Rennell’s map of 1785, the Brahmaputra at that time flowed southeast across the Mymensingh district where it was joined by the Surma and then it directly united with the Meghna. The Brahmaputra is a very young river, and its present configuration in the Assam Valley took place only during the Quaternary. Since it flows through a highly seismic zone, its morphology gets influenced by tectonic and geographic disturbances caused by earthquakes. It has the largest river island in the country at Majuli in upper Assam, which is 90 km long and measures 20 km at its widest. The Indus is one of the great rivers of the world. It is this stream, originally called the Sindhu, which gave this country its name. The Indus Valley with its highly fertile plain has been the cradle one of the oldest civilizations in the world – the Harappa. Along with its main tributaries – the Satluj, Chenab, Jhelum and the Ravi – it forms a system of five main rivers after which the province of Punjab is named (Punj = five, aab = water). The Satluj is the only one of these rivers to join the Indus direct. The Jhelum and the Ravi unite with the Chenab which in turn pours into the Satluj. There are some other streams, some quite large, which flow into these five main rivers. In the Punjab plain, most of these rivers, particularly the Indus, form two or more channels at several places giving rise to large islands and bars. These streams bring a large volume of water and sediments which make their doabs (areas between rivers or interfluves) enormously rich and productive agricultural lands. The Punjab is rightly called the granary of India. The main doabs in the Punjab are the Bist Doab between the Beas and the Satluj, the Bari Doab between the Beas and the Ravi, the Rechna Doab between the Ravi and the Chenab, the Chaj (or Jech) Doab between the Chenab and the Jhelum, and the Thal Doab which is a large triangular patch or interfluve between the Indus and the Jhelum and is also known as the Sind Sagar Doab. Since it is a vast arid plain it is also called the Thal Desert or the Desert of the Indus. The Indus is born in the glaciers of the Kailas Range in western Tibet and flows northwest from there at an altitude of roughly 4,500 m. After entering India, it continues to take the same direction between the Ladakh and the Zaskar Ranges, falling to some 4,000 m. About 50 km before Skardu, it is joined by the Shyok at an elevation of about 2,700 m. Forty kilometres downstream from Skardu, at an elevation of about 2200 m, the Indus enters its 480 km long antecedent gorge. It takes a sharp southerly bend north of Bunji and enters the plains near Tarbala at an altitude of 400 m. During its journey through this long defile it falls 1,800 m at an average gradient of four metres per kilometre. Thereafter it receives the Kabul River from its right at Attock, and flows first through the high Potwar Plain and then after crossing the Salt Range through the fertile Punjab and Sind Plains, before ending its 2,900 km journey into the Arabian Sea near Karachi. The Shyok is an important tributary of the Indus, but since its entire passage is only through the deep recesses of the Higher Himalaya, it is generally not well known. It issues from the glaciers of the Karakoram Range and after flowing southeast for some 180 km makes a hair-pin bend to take a northwest direction parallel to the Indus for over 300 km before pouring into the Indus near Kiris, north of the Deosai Mountain. In the latter course of the Shyok and the Indus are separated by the Ladakh Range. The principal effluent of the Shyok is the Nubra River which has its source in the Siachen Glacier. The Nubra Valley is a flat plain, only a few kilometres broad, bounded on either side by vertical cliffs, 1,200 to 1,500 m above the river. The Kabul River is another right bank tributary of the Indus. It arises in the southern Hindu Kush Mountain near the Unai Pass and breaches the Afghanistan-Pakistan boundary north of the Khyber Pass before discharging into the Indus at Attock. At Jalalabad in eastern Afghanistan, the Kabul River is joined by the Kunar which is called the Yarkhun in the Chitral region; the Yarkhun collects the drainage of the eastern Hindu Kush where it is borne northwest of the Tirich Mir Peak. The Satluj (Sutlej) River (called Langqen in Tibet) rises from the Manasarowar-Rakas Lakes in western Tibet, within 80 km of the source of the Indus. 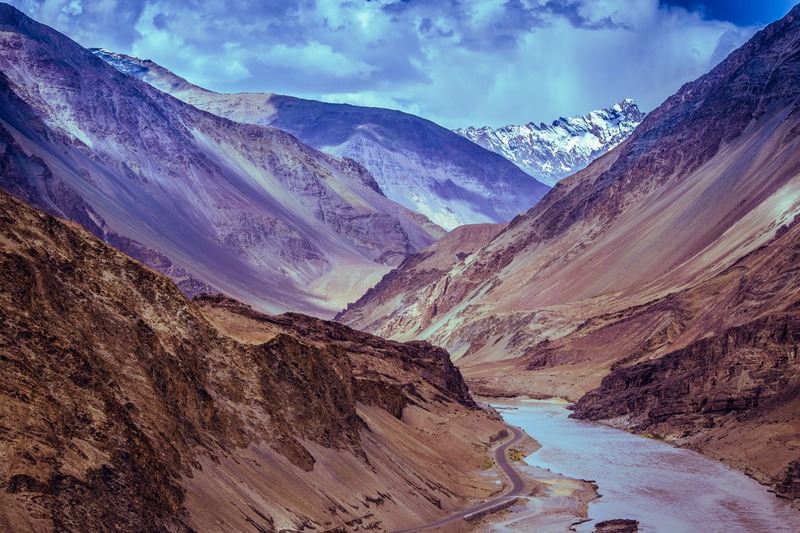 It also takes a north-westerly course like the Indus up to the Shipki La pass on the Tibet-Himachal Pradesh boundary and then turns south-westwards. In the Nari Khorsan province of Tibet, it has created an extraordinary canyon, comparable to the Grand Canyon of Colorado, through the unconsolidated sediments filling the valley; the channel here is 900 m deep. It descends to the plains at Rupar in the Punjab – after it is impounded by the Bhakra-Nangal Dam to form the Gobind Sagar Lake. Through this stretch the Satluj also cuts across the strike of the Himalayas as an antecedent stream through a straight, steep-walled gorge, 1,525-3,570 m deep and 160 km long, between Shipki and the north of Shimla. At Shipki La, the river flows at an altitude of about 3,000 m, while the summit of Leo Pargial peak, 7 km away, is 6,791 m tall. In the Rampur Valley, it flows at an elevation of 1,200 m between peaks of 5,234 m about 18 km on the south and 6,240 m nearly 35 km on the north. Its level falls only 850 m at the Bhakra site during a journey of some 200 km. From near Ferozepur to Fazilka, it forms the boundary between the Indian and Pakistani Punjabs. The Satluj joins the Indus a few kilometres above Mithankot in Pakistan, but some 70 km before that it collects the drainage of the Chenab. Between Rupar and Mithankot, a distance of almost 900 km, the Satluj has a low gradient as it flows over a plain of remarkably gentle topography. Its total length is about 1,450 km. The Satluj is supposed to have flowed in its course over the plains at one time (about the 10th century) through Patiala and Bikaner, and joined the Indus in southern Sind. However, it now turns to the west on leaving the plains to join the Beas. The Beas River (Vipasa in Sanskrit) has its origin near the Rohtang Pass on the southern end of the Pir Panjal Range, close to the source of the Ravi. It enters a gorge, 900 m deep, at Larji, where it takes a westerly course through the Siwalik Hills emerging on the plains at Pong; thereafter it flows southwards to join the Satluj near Harike. It is a very short stream, only 460 km long, entirely within India. The Beas is being linked with the Satluj for power and irrigation through two tunnels in the Mandi district of Himachal Pradesh: The Pandoh-Baggi tunnel (13 km) and the Pungh-Slapper tunnel (12 km); the two are separated by a 12 km long open channel. The Chenab River (Sanskrit-Asikini) originates from near the Bara Lacha Pass in the Lahaul-Spiti part of the Zaskar Range; two small streams on opposite sides of the pass, namely the Chandra and the Bhaga, form its headwaters. It takes a north-westward course and then after a sharp southward bend at Kishtwar through a tremendous 290 km long gorge, sometimes 1000 m deep, turns west emerging on to the plains at Riasi in Jammu. From here it swings to southwest through the plains of Pakistani Punjab until it unites with the Satluj at the Panjnad after travelling a total distance of 1,000 km. Like the Beas, the Ravi River (Iravati in Sanskrit) too arises from the southern slope of the Pir Panjal, but west of Manali, it courses between the Satluj and the Chenab. The passage of the Ravi through the hills is quite short and it emerges on the plains at Madhopur. Flowing through the Punjab Plain, it debouches into the Chenab some kilometres above Rangpur in Pakistani Punjab, traversing 700 km in all. The Jhelum River flows for over 700 km through its course, taking birth in the Pir Panjal Range near Banihal Pass in Kashmir and ending at Trimmu (Pakistan) on the Chenab. Its early course lies northwest though the Vale of Kashmir. Passing through the Wular Lake at the head of the Vale it flows in a westerly direction; below Baramula, it forms a 200 m deep defile with almost perpendicular walls. It takes a sharp hairpin swing southward at Muzaffarabad; thereafter it forms the India-Pakistan boundary for 170 km to emerge at the edge of the Potwar Plateau near Mirpur. After skirting the Salt Range on its south, it flows through the northern Punjab Plain before meeting the Chenab. All these rivers have been continually changing their courses in the plains, even during historical times, for which evidences abound. Several towns which flourished on their banks during living memory have been swallowed up by them, leaving hardly any traces. Teh Jhelum originally flowed in a southeast direction, opposite of its present course, into the Chenab Valley, as is made amply clear by several of its tributaries which join it in a direction opposite to the present course. The Chenab flowed east of Multan in 1245 AD. The Beas then filled its old course near Dipalpur, and the Jhelum, the Chenab and the Ravi met northeast of Multan and joined the Beas 45 km south of Multan. The Beas was captured by the Satluj at the end of the 18th century. Earlier, it flowed from near Harike, between Kapurthala and Ferozepur, to the Chenab above the Panjnad along an alignment paralleling west of the modern Satluj course. Its old course can easily be marked out now. The Satluj at one time flowed directly into the Rann of Kutch. It was a tributary of the Hakra and flowed into the Eastern Nara; it had taken a northerly direction by 1245 AD, by which time the Hakra had dried up. The Satluj again changed its course by about 1593 AD. Few further changes in the river courses have taken place since 1796 AD. In many cases, the abandoned channels and courses of these rivers can even now be delineated on the ground. The Indus forms a simple delta, practically flat and containing numerous old channels. It extends for about 200 km along the coast, and occupies an area of about 7,800 sq km. 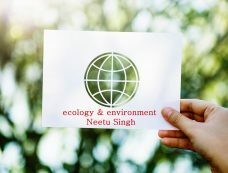 A large part between Karachi and the mouth of the river is swampy waste in which hardly any large trees grow, in marked contrast to the highly forested delta of the Ganga.